Depending on your age and perhaps gender, you may have never partaken of evaporated or condensed milk, at least not knowingly. 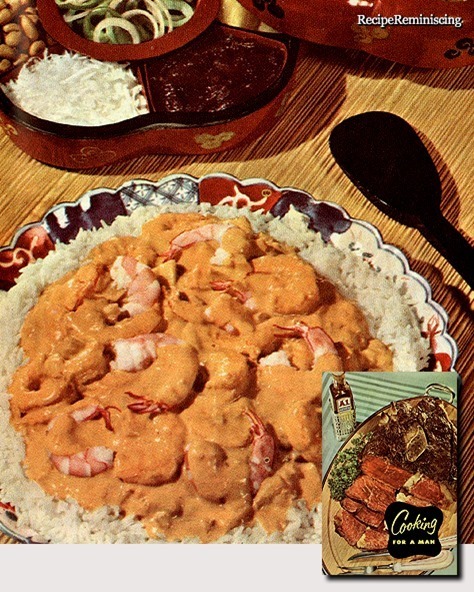 Chances are your grandmother or great-grandmother made at least one heirloom comfort food using one or the other. In the early part of the 1900s, both were used more than fresh milk because they were more shelf-stable and posed less of a health risk than fresh milk. Of course, this was before the government had laws in effect to insure the safety of fresh milk, not to mention refrigerators as standard equipment in every kitchen. Those in the armed forces are familiar with both of these milk staples. 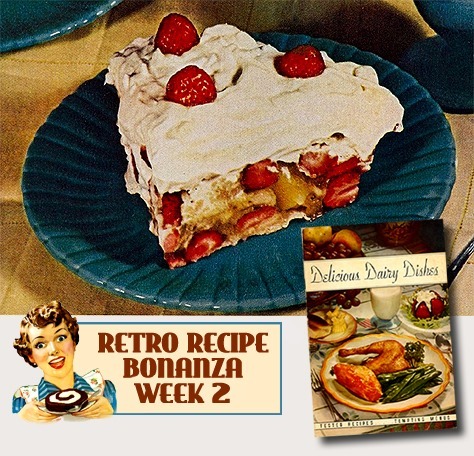 Today, low-fat, skim and non-fat versions are available with recipe applications not limited to sweets and desserts. Learn more about evaporated and condensed milk before trying the canned milk recipes. 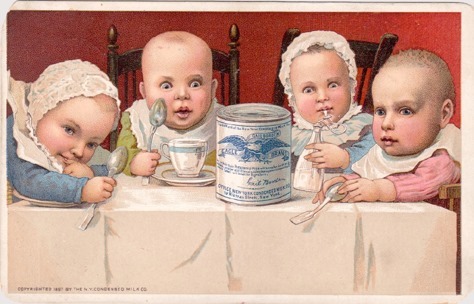 Prior to the nineteenth century, drinking milk was an iffy situation with regard to health risks. Milk straight from the cow was loaded with bacteria. Milk not consumed within a matter of hours in summer soon spoiled in the heat. Illness allegedly derived from contaminated milk consumption was referred to as “the milksick,” “milk poison,” “the slows,” “the trembles,” and “the milk evil.” Granted some of these illnesses (considering modern-day knowledge of lactose intolerance) were probably not due to the milk or milk alone, but the stigma persisted. 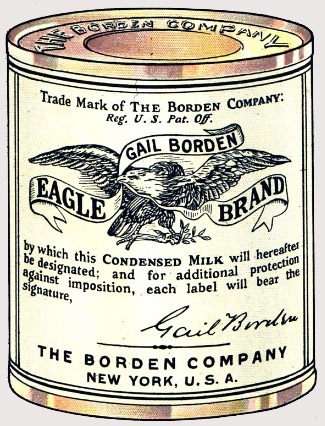 The idea for a portable canned milk product that would not spoil came to Gail Borden during a transatlantic trip on board a ship in 1852. The cows in the hold became too seasick to be milked during the long trip, and an immigrant infant died from lack of milk. Borden realized his goal in 1854. 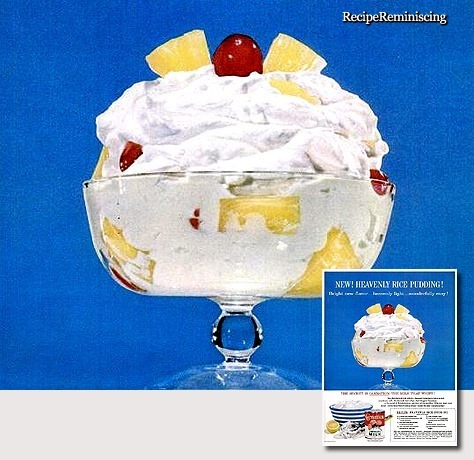 His first condensed milk product lasted three days without souring. He first thought the condensing process of the milk made it more stable but later on realized it was the heating process that killed the bacteria and microorganisms that cause spoilage. 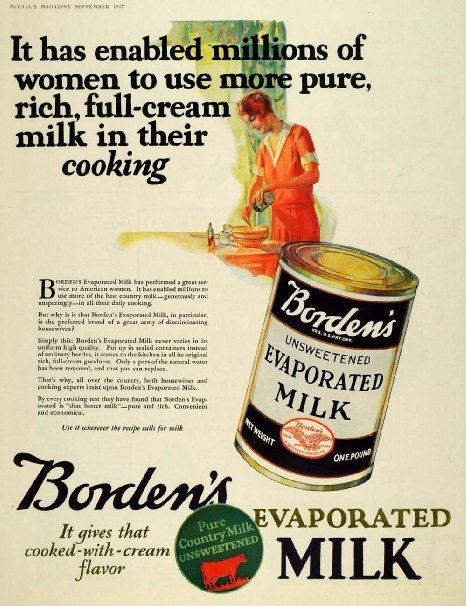 Borden was granted a patent for sweetened condensed milk in 1856. The sugar was added to inhibit bacterial growth. Skim milk devoid of all fat was used. Use of this early version lacking in nutrients as a mainstay for young working-class children has been blamed for contributing to a rash of rickets cases in 1905. The Borden Company issued this press release in 1924, extolling the virtues of its product “in relief work among war refugees and in the treatment of public school children of New York”. 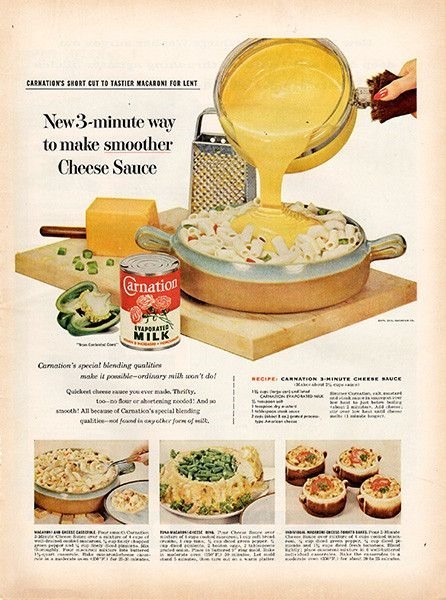 Borden’s new condensed milk product was not well-received in its early days. In those days, customers were used to watered-down milk, with chalk added to make it white and molasses added for creaminess. 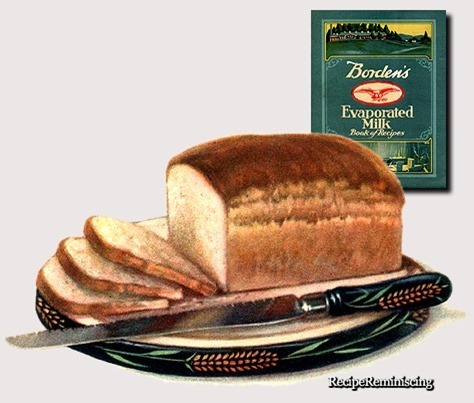 Borden had begun commercial production in 1857 in Burrville, Connecticut. When the dubious practice of feeding New York cows on distillery mash by competing fresh milk suppliers was exposed by Leslie’s Illustrated Newspaper, Borden’s condensed milk business greatly benefited. 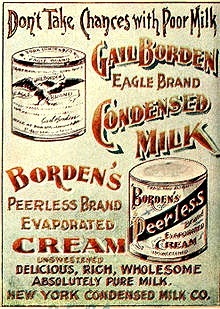 In 1861, the Union Army purchased Borden’s condensed milk for use in field rations, further bolstering its success. It was John Baptist Meyenberg who first suggested canned evaporated milk to his employers at the Anglo-Swiss Condensed Milk Co.
in Switzerland in 1866. 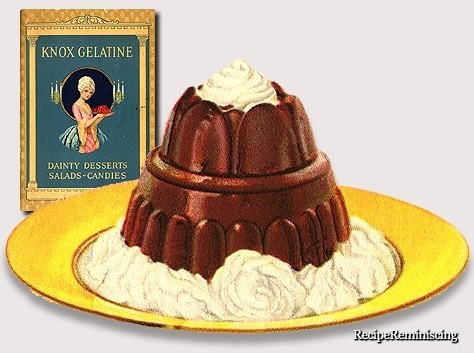 Since the company was already so successful producing sweetened condensed milk, the idea was rejected. Meyenberg emigrated to the United States and began his own company, Helvetia Milk Condensing Co. (Pet Milk), eventually marketing unsweetened condensed milk in 1890. 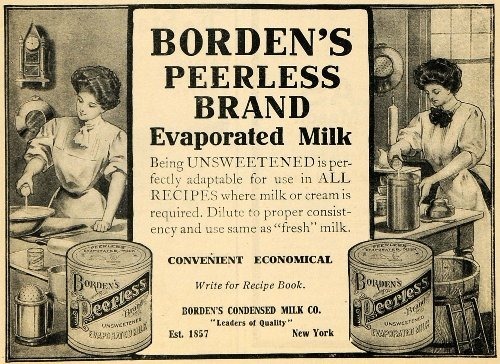 Although Borden received his patent in 1854, unsweetened condensed milk was not successfully canned until 1885 by competitor John Meyenberg. 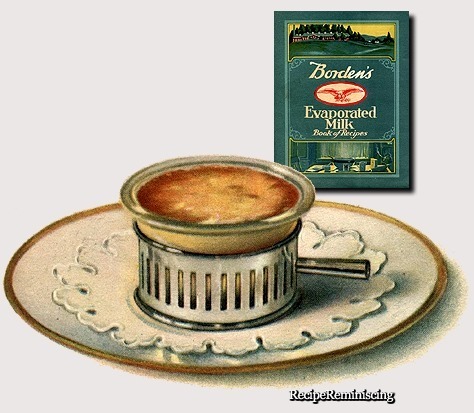 Borden added evaporated milk to the product line in 1892. In 1899, Elbridge Amos Stuart came up with a new process for canned, sterilized, evaporated milk. With help from evaporated milk pioneer Meyenberg, Stuart began successful mass production of canned evaporated milk. Evaporated milk manufacturers pioneered the use of homogenization (redistribution of fat globules so they are imperceptibly distributed), but dairies producing fresh milk were slow to follow the homogenization trail. With all the talk these days of irradiating foods to eliminate microorganisms that cause foodborne illness, you may think it a relatively new procedure. Not at all. 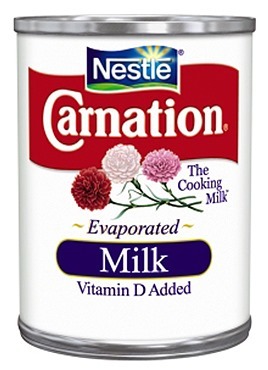 In 1934, Pet Milk Co. introduced the first evaporated milk products to be fortified with vitamin D via irradiation processing. Nowadays, less than two percent of the United States milk production is evaporated or condensed. How about a chicken-fry without all that bothersome frying? 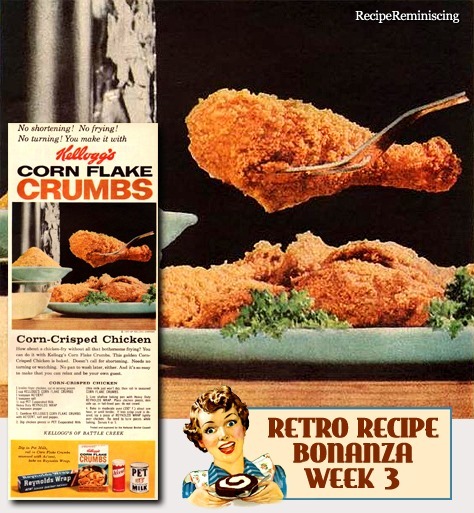 You can do it with Kellogg’s Corn Flake Crumbs. This golden Corn Crisped Chicken is baked. Doesn’t call for shortening. Needs no turning or watching. No pan to wash later, either. And it’s so easy to make that you can relax and be your own guest. 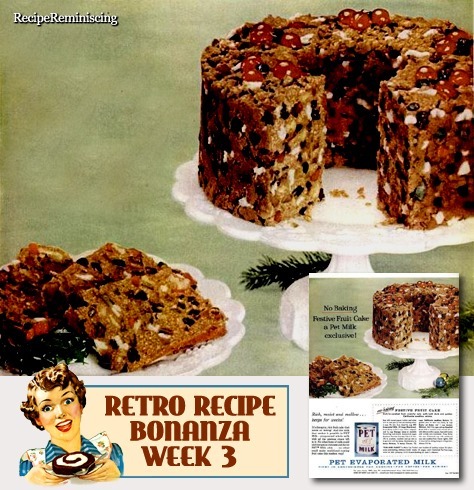 A fruit cake rich in candied fruit, crunchy nuts, with both dark and golden seedless raisins. 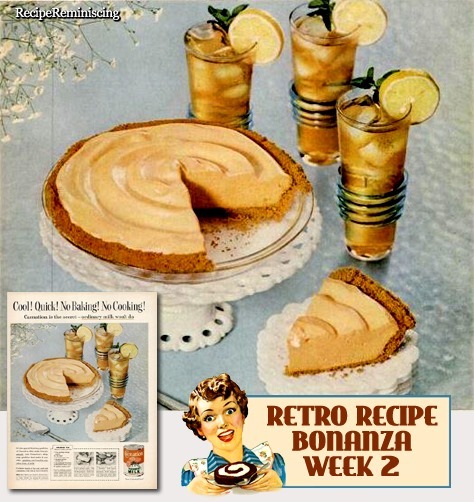 Evaporated milk was a popular product before refrigerators were common in homes, but is now a niche product mainly used in baking and other recipes. 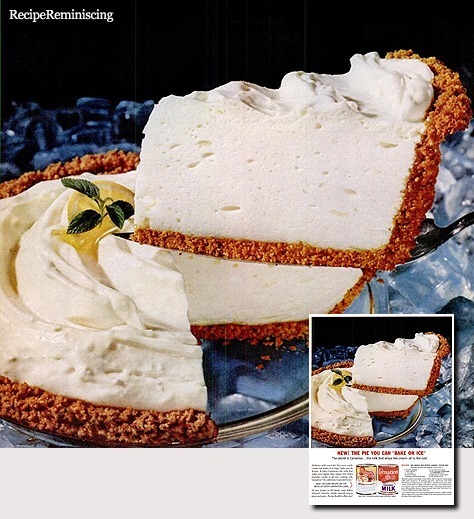 Pet, Inc., was an American company that was the first to commercially produce evaporated milk as a shelf-stable consumer product and later became a multi-brand food products conglomerate. Its signature product, PET Evaporated Milk, is now a product of The J.M. Smucker Company. PET Dairy is a regional brand of fresh and processed dairy products in the Southeastern United States made by the Land-O-Sundivision of Dean Foods. Many of the remaining brands once owned by Pet, Inc. are currently part of General Mills. The product takes up half the space of its nutritional equivalent in fresh milk. When the liquid product is mixed with a proportionate amount of water, evaporated milk becomes the rough equivalent of fresh milk. This makes evaporated milk attractive for shipping purposes as it can have a shelf life of months or even years, depending upon the fat and sugar content. 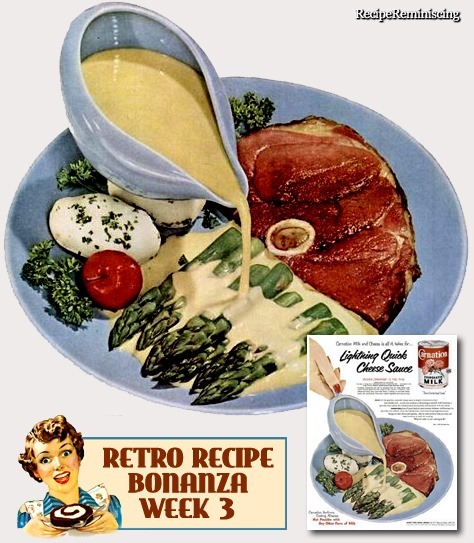 This made evaporated milk very popular before refrigeration as a safe and reliable substitute for perishable fresh milk, which could be shipped easily to locations lacking the means of safe milk production or storage.